The 5400 series of phones offer a high-end feature set, including a productivity local call log and speed dial directory. With an advanced user interface, the 5410 digital phone's 5 line, 29 character display eliminates the need for paper labels. 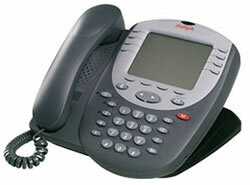 High-end feature set with productivity local call log and speed dial directory. Reduced installation and move costs - no paper labels . Investment protection with downloadable firmware. Large screen 7 line x 29 character display. 9 Fixed feature keys below the display. Eight Personalized Ring Patterns .